The Difference Between Bellows Technologies » HHP Associates, Inc.
What’s the right bellows for your application? The way bellows are made, including hydroforming, edge-welding, and electrodeposition, determines the sizes, shapes, materials, and, ultimately, the function of the component. 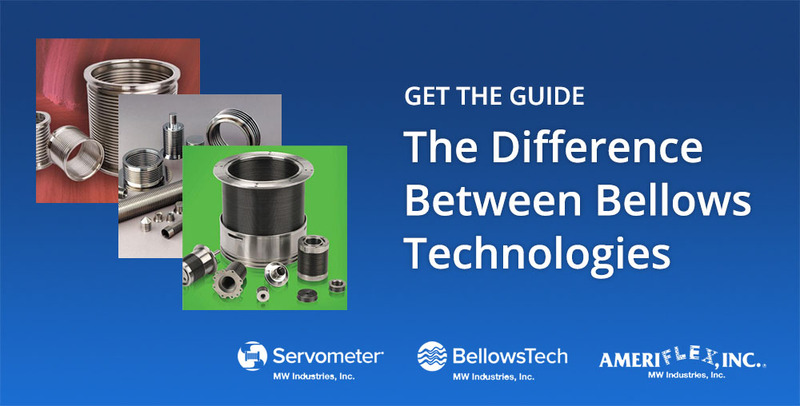 Download this “Difference Between” guide to learn how to get the best-performing bellows for your application. MW Industries, Inc. (MWI) is one of the world’s premier manufacturers of products that make machines, engines, and complex sub-assemblies work harder, better, longer, and faster. Their full line of industrial springs, fasteners, machined parts, and flat-stamped spring-related products are engineered for peak performance and made from the world’s best materials. Servometer® is the leading technology expert in the manufacture of custom precision electrodeposited metal bellows, bellows assemblies, flexible shaft couplings, electrical contacts, and rigid electroforms using a patented electrodeposition process. BellowsTech is a premier manufacturer of high quality, dependable edge welded bellows and assemblies. Engineers in the aerospace, medical, semiconductor, UHV, and oil and gas industries rely on BellowsTech products for the highest cycle life, responsive design, wide material selection, and leak-tight performance. Ameriflex is a wholesale manufacturer of electronic component parts addressing the needs of the semiconductor, aerospace, lab and university, and power generation industries. Since 1981, they have built their reputation on precision, experience and quality manufacturing, becoming nationally recognized as the foremost manufacturer of precision bellows and related vacuum products. If you would like to talk with us about a solution for your app, we invite your inquiry here.